Unable to create directory wp-content/uploads message error that I had today. I have ever found this problem months ago, and today I suddenly got this error again. 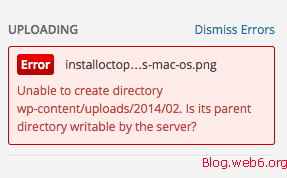 Navigate to this page if you want to see another error while uploading images that can happen to WordPress. Then I googled around, most people will change their file permission to 777, which is also right, but I would prefer changing back to 755 if I am done. 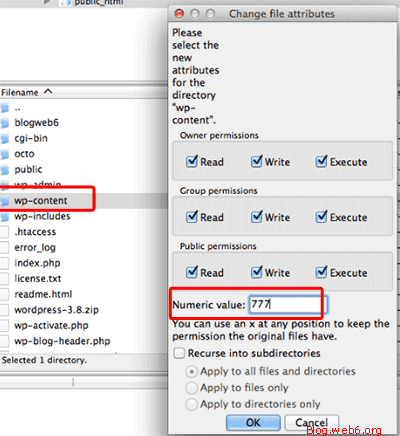 See more on Changing wordpress file permission in this page. It’s a quick tip, so here are the steps, be sure you read it until the end. 1. Access your WordPress folders with FTP client, or access it directly to your cPanel. In this tip, I am using FileZilla FTP client on Mac, so here is quick tutorial configuring SFTP if you don’t have one already. I assume you can use FileZilla or an FTP client by now. Open it, and connect to your web server, access your wp-content. 2. 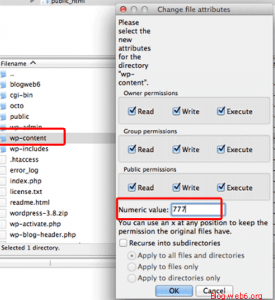 Change file permission for wp-content to 777. 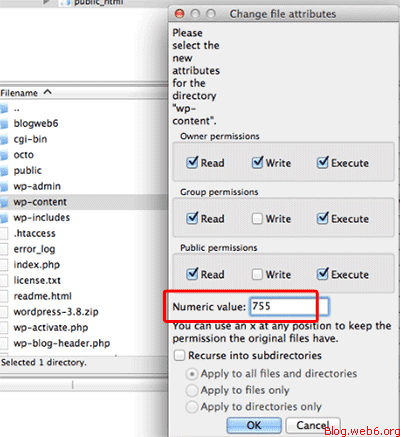 In FileZilla, simply select the folder, and right click, select on “File Permission”. Change it to 777 on “Numeric Value” box. Then upload back to your server. 3. Upload an image in your WordPress’s dashboard. Don’t forget to compress your image to reduce file size, see this tip. Once it succeeds, go back to your FileZilla again, repeat the step no 2 above, but change 777 to 755 again. It should be a secure File Permission for your wp-content, and also now, you won’t have “Unable to create directory wp-content/uploads” error message again.